As explained in Part 1, one-way couplets are not inherently auto-oriented, and in fact can be much better for Place-Making than multi-lane two-way streets in most circumstances. Part 2 focuses on existing examples of good one-way couplets and conceptual designs. They are more common than people think, and it is easy for walkability architects to create great renderings to highlight how couplets can play a key role in the marriage of walkable development with multi-modal mobility. Can the tortoise win the race? Watch the video before reading this article, or see Innovative Intersections. One-way streets are a common thread linking America’s largest and most successful urban centers – Portland, Denver, Manhattan, New Orleans, and even Boise, Idaho. Each of these have many examples of walkable, narrow, low-speed couplets. Alternative modes are vital in all of these, but their ecosystems still require vehicle circulation for deliveries, construction, transit, and a great many private and shared autos. 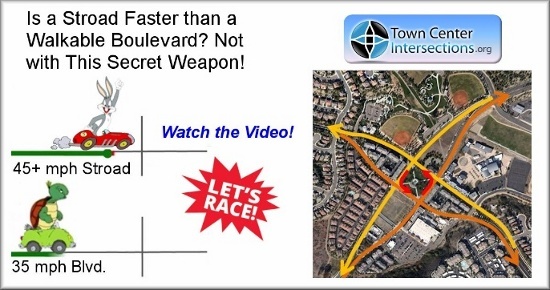 Their network of one-way streets ensures that no particular street has overwhelming traffic. Here are some examples. Try converting one-ways in these busy centers back to two-way, and you’ll create immediate gridlock. In turn, “cars stuck everywhere” would increase the sense of auto-dominance and would hinder market interest in further development. “Where did all these cars come from? Did we suddenly become auto-oriented?” – Nope, same cars, but it feels like 3-times as many because they’re stacking up for blocks, never able to get out! Congestion decreases Livability, and limits the market’s ability for continued development. Auto-access may not sound like a critical component of Transit-Oriented Development, but it is. Developers understand that even if alternative modes gain impressive shares, odds are most trips to/from their potential development will still be by vehicle. So when congestion becomes chronic, some developers will opt for further out but less congested sites. Thus one reason we sprawl outward is that congestion won’t allow us to grow inward. Two one-ways will provide more access and less delay, even at lower speeds, than two two-ways with the same total of lanes. Would-be Activity Centers may never reach critical mass for major transit investments until first growing as dense as auto-access can allow. 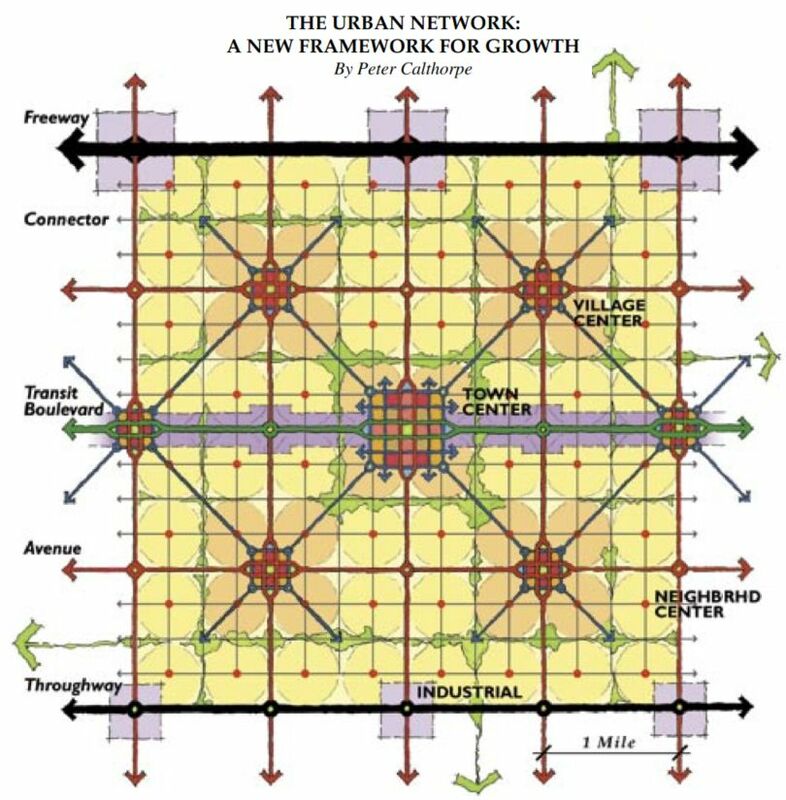 Peter Calthorpe has published a short white-paper titled “The Urban Network, a New Framework for Growth.” The primary diagram from that article is shown below. Notice that one-way couplets are a key feature of Calthorpe’s Town Centers and Village Centers. He notes that the couplets are a good way to provide significant vehicle access to the core centers, within a “slow-but-steady” very pedestrian-friendly framework. Personally, I think Calthorpe’s entire framework is a stroke of brilliance and a very good model for any/every Greenfield area poised to urbanize in the near future. His paper also discusses the San Marcos Town Center, noted in Part 1. Calthorp’s paper also provides some analysis of a Town Center at Issaquah Highlands just east of Seattle, shown below. The default plan would have resulted in a single huge intersection with 166 ft for pedestrians to cross. On the couplet, one street requires a 40 ft crossing, and the other just 28 ft. The couplets also allow on-street parking, which would have been unattractive (under-utilized) and possibly disallowed in the default plan. 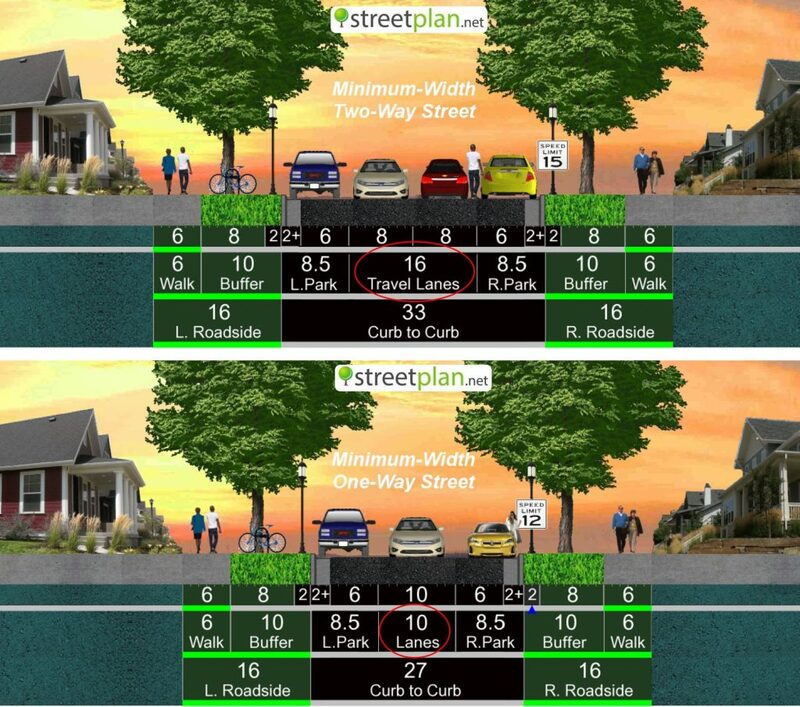 Traffic engineers estimated 11% faster actual time with the couplet in spite of additional intersections, on-street parking, and reduced speed limit. Obviously creating a couplet requires a second street – challenging to retrofit if there is no second street, or if the candidate alignment has politically challenging uses. Thus c ouplets are ideal for Greenfield areas with potential to evolve as centers. One drawback of a couplet is that for transit, people prefer to come back to the same place they got off. Not a big deal if separated by just a block, but becomes onerous in wider couplets. In Greenfield environments, consider creating a “Triplet” such as in this figure. As traffic approaches the center, it diverts onto one-ways as in the Calthorpe design. 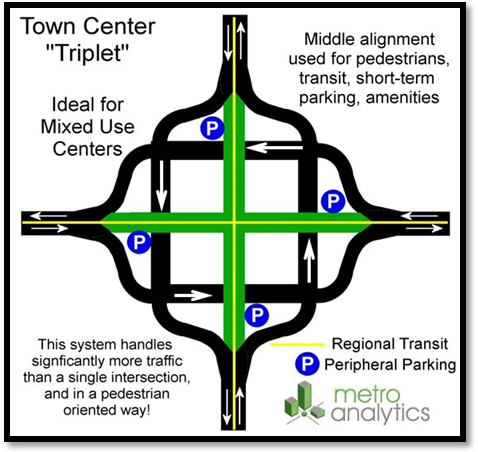 But if you add a middle alignment (shown in green), then transit can continue on to what might be a pedestrian plaza. The middle can also be used for angle parking, etc. If you then design parking at the outer edges of the center, and connect it with high-frequency shuttles, you may need almost no parking closer to the center, which helps keep it walkable. Denver’s 16th Street Mall and Boulder’s Pearl Street are good examples of triplets. 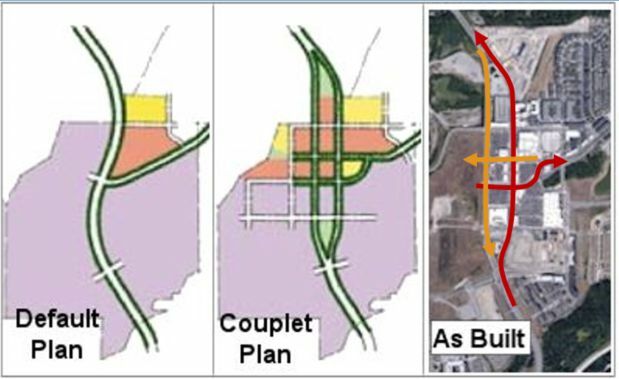 This Greenfield concept for Salt Lake’s West Bench shows how a major arterial entering the activity center (black) can be split into one-way streams, and slowed to 30 mph. 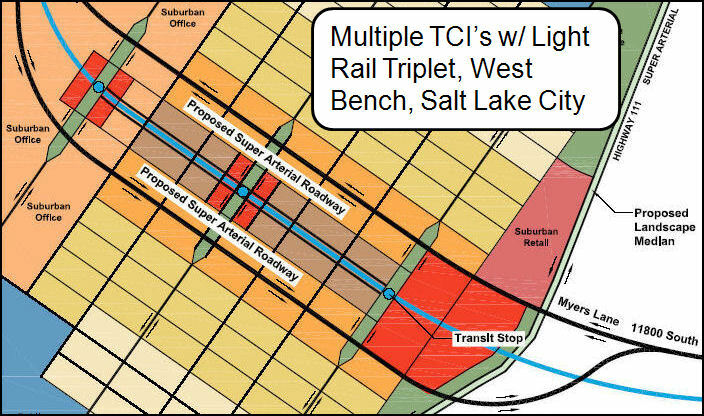 A center alignment (blue) is for light-rail and other pedestrian-oriented uses. The arterial couplet crosses several other smaller couplets, as well as many two-way streets. I helped Logan with their transportation master plan. They have a unique situation where Main Street is already carrying a pummeling 40,000 vehicles per day on a 5-lane cross-section, and that number will increase and spill into neighborhoods, because the region is on-course to double in 30-years, but with few opportunities to divert traffic. When I showed city and business leaders how a conversion to couplets would handle their long-term traffic needs, but also allow them to increase downtown’s relevance by growing to a second street, and greatly improving the pedestrian-realm on their historic Main Street, they were very excited! The conversion allows for new bike lanes, additional landscape, and potentially even angle parking in some places all within the same 126 feet! Below is just one of many configurations yet to be explored, but at least with a couplet they have options they didn’t have before. Below are more renderings and analysis from our Logan study. The existing 5-lane cross section has 62-ft of pavement for traffic, and is expected to flow at just 7 mph in the PM peak in 2040. But if converted to a couplet, there might be just 33-ft for traffic, and an average of 20 mph when factoring in stop-lights at cross-streets (same 35 mph speed limit in both cases). It is almost a given that local, residential streets, are always built as two-ways. But suppose they were built as one-ways instead? Below is a diagram and analysis of the savings in land and pavement. A very tight two-way street would tend to have about 16-ft in the center between parking for two vehicles to squeeze past each other. However the same street as a one-way could potentially have just 10-feet between parking. 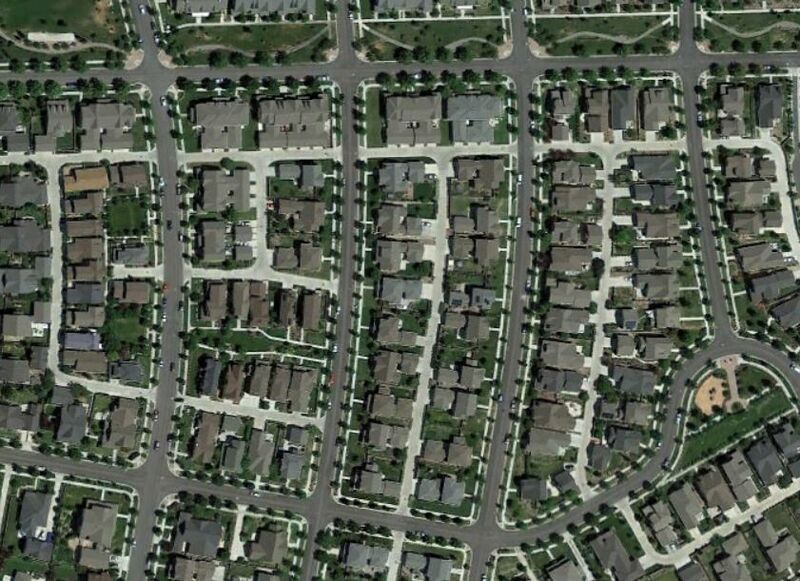 To assess the potential savings, I took this New Urbanist neighborhood from Daybreak, in South Jordan, Utah. It has about 18 NS streets per mile of width, and about 10 EW streets per mile of height (ignoring backside access alleys shown in concrete). Multiply it all out, and in a square mile of two-way streets there are about 95 acres dedicated to asphalt – 15% of the entire square mile. But if the same streets were one-way, they’d consume only 75 acres, or 12% of a square mile. That’s another 20-acres for more homes, larger parks, whatever! It also reduces long-term pavement maintenance costs by about 20%. Odds are it would also reduce observed speeds and improve safety. How? Most of the time, two cars are not passing on a two-way street, so a driver has a wider overall space to drive in, which encourages higher speed. 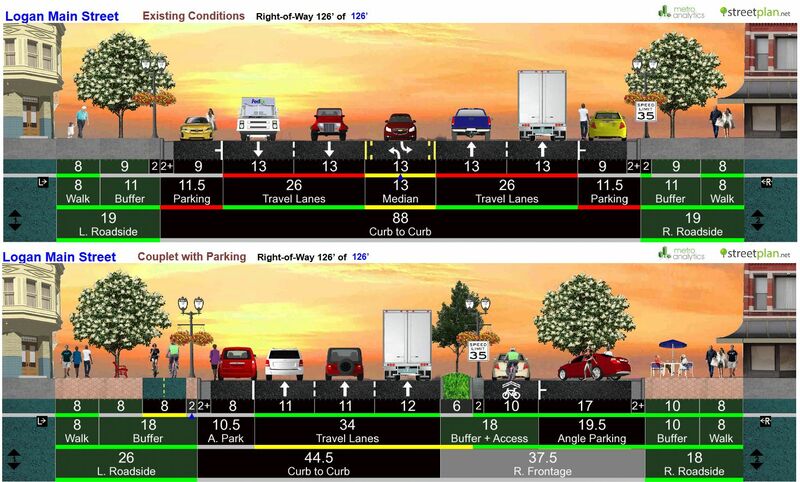 It might also increase walking and biking, because both modes can travel either direction on a one-way street, a competitive advantage over cars for short trips, because some auto trips would have a block-longer trip length. There is nothing inherently auto-oriented about one-way streets, especially relative to large two-way 5 and 7-lane stroads. They need not be high speed unless designed that way, intentionally or unintentionally. They are more efficient at moving more vehicles with less delay. But just because something good has happened for cars (less congestion), we need not conclude that something bad has happened for other modes. When all modes are doing well, there is no drag on a Center’s ability to expand. Traffic delay creates the feel of auto-oriented, because vehicles stacked up for blocks annoy everyone, and pressures engineers to “go rouge.” Couplets help vehicles keep moving even at low speeds. If planning a large Greenfield area and there is no support for couplets at the moment, lay out a grid of two-way streets that could easily convert to one-ways if future residents think it will help. Safer for autos and pedestrians Convenience stores may have initial loss. If synchronized, low speed limits observed Unwarranted stigma to overcome.